You are certainly aware that I am recommending LinkedIn to IP lawyers and Patent Attorneys. You can use LinkedIn Learning if you are a LinkedIn member. Even the FREE basic LinkedIn membership does work for the start. This article will show you how you can take locked LinkedIn Learning courses for FREE, if you know a LinkedIn member with a Premium Membership. I have underestimated LinkedIn Learning for a long time until I tried it out myself. Now I find it amazing. Wikipedia says that LinkedIn Learning is a massive open online course website offering video courses taught by industry experts in software, creative, and business skills. It was founded in 1995 by Lynda Weinman as lynda.com before being acquired by LinkedIn in 2015. So this is not just a curated collection of some videos on the Internet, LinkedIn Learning once was a successful start-up company from the baby years of the Internet. They know what they do, and you will see the difference between teaching videos on the Internet and LinkedIn Learning once you try it out yourself. Please don´t ask me why LinkedIn has changed the brand name from “lynda.com” to “LinkedIn Learning”. 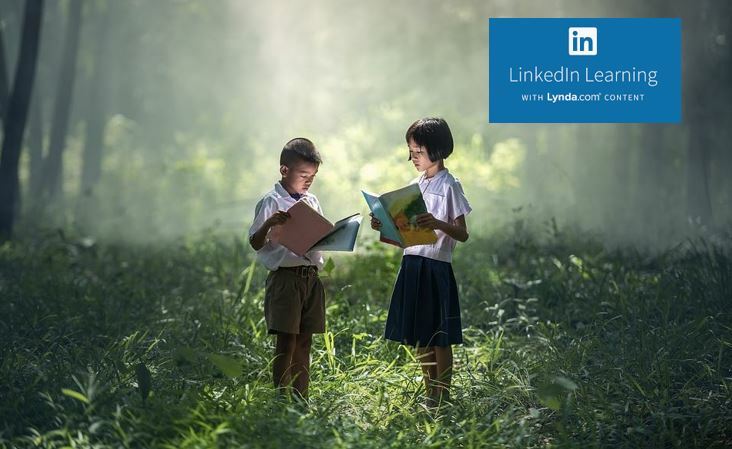 Fact is that there are now both the “lynda.com” and the “LinkedIn Learning” websites, in parallel, and you can use your LinkedIn account to log in at www.lynda.com. It seems to me that the courses offered at www.lynda.com are identical to the courses offered at LinkedIn Learning, although the library on “LinkedIn Learning” is organized more according to the needs of a business user. There are more categories in the “Creative” and in the “Technology” sector. I find that the best way to find courses is to use the search field, by entering a topic that you would like to explore more. Enter “Microsoft Word Tips and” and the following drop-down menu will appear. As you see on the left side of the screenshot above, you can reduce the number of hits by selecting the time to complete the course and the teaching level. You can save courses by clicking on the symbol on the right side of the above screenshot. I have circled it in red color. Saving your selected course is important when you want to find it again easily, for example when you want to access it from the LinkedIn Learning app on your smartphone. Install the LinkedIn Learning app on your smartphone because then you can download the courses and listen to them while you are driving or riding a train. Please note that saving courses as “audio only” saves memory on your smartphone. Now that is a powerful feature. If you are a Premium Member on LinkedIn, you can unlock and share courses in LinkedIn Learning with Standard LinkedIn members. Please note that you must be logged into LinkedIn in order to be able to view the course. Click the “View Course” link underneath the video for getting free access to the entire course if you are a Standard LinkedIn member! If you just click on the video itself, the largest part of the course will be locked for Standard LinkedIn members. Now, this is the big advantage of LinkedIn Learning. It will give you accredited degrees. You will receive a good education — a great education — and you can get it without spending anything except an internet connection and a laserjet printer. And LinkedIn will even give you a formal certificate that you can print out and add to your other educational certificates. In addition to that, you can display completed courses on your own LinkedIn profile so that everyone can see your personal growth and your achievements. This feature can be used for improving your employees´ professional capabilities. You can encourage them to invest two hours per week into their personal growth, by taking LinkedIn Learning courses, and you can monitor that by checking their LinkedIn profile, for rewarding them with a paycheck bonus. The LinkedIn Learning feature gives a good introduction into what I expect to come. Internet will boost education. University is not about getting a good education. University is about getting an accredited degree. And it is true. From my own experience, the good professors only teach graduate classes. The undergraduate classes were taught by his assistants. I read under great minds, such as Erich Truckenbrodt, Joachim Milberg, Friedrich Pfeiffer, Franz Mayinger, Franz Holzweissig, Udo Di Fabio, and Roman Herzog, but this was only during graduate studies. You do not need to go to a prestigious university in order to get a good education. The best education is self-education. You can use the World Wide Web to get access to books and educational materials of all kinds. Google Books offers hundreds of thousands of them. Project Gutenberg offers thousands. The Massachusetts Institute of Technology and Harvard University are jointly putting their curriculum online free of charge. So are 35 other major universities. They are part of a system called Coursera (www.Coursera.org). For the textbooks, you can buy older editions cheaply on Amazon. Get yourself a free Standard LinkedIn account. Then check out one of the courses that I have unlocked for you, for example this one.